Now that the school year is in full swing, there is a lot of action going on in the lives of students, parents, and teachers. Unlike in the summer, activities students do now are graded, judged, or critiqued—as it should be to a degree, but as adults, we must always be mindful of how that can create a lot of pressure and can discourage a child. One way this can occur is in the area of athletic competition. Now I am not going down the road of anti-competition where everyone wins (if you follow the previous link, please understand that it is satire), but we need to be careful, thoughtful, and encouraging. Competition is good. Winning is good. Losing is good. Yes—losing is good. Losing is good if a lesson can be learned from it. One of the most important things you can teach a child from losing is that their value is not tied to winning or losing. Rather than asking, “Did you win?”, try something different—”Did you have fun?” or even “How did you do?”—with the you being the singular, second-person pronoun. These allow for conversations without a focus on the win or loss. You can talk about certain plays, personal improvement, and follow the conversation where it goes—giving you a chance to connect. Give it a try after the next game. Posted byblake_matthews October 5, 2013 November 11, 2018 Posted inUncategorizedLeave a comment on Did You Win? The annual back-to-school Florida sales tax holiday is next weekend, August 2 through August 4, 2013. This year it includes tech items ranging from thumb drives to tablets—even computers if sold for $750 or less. So when you plan your back-to-school shopping don’t forget to include technology. For more details and a complete list of items exempt from sales tax during the weekend, please view the flyer from the Florida Department of Revenue. One of the more recent buzzwords in education is the “flipped classroom.” It seems that in most conversations I have heard it in, people use it as a synonym for some kind of new technology in the classroom when in fact it is almost the opposite. While technology can—and should be—a component of the flipped classroom, it is not the pièce de résistance. For example, knowledge and comprehension are often the focus in the classroom. We lecture, provide definitions, and assess the student’s comprehension through tests and quizzes. Application, analysis, synthesis, and evaluation are often left for students to work on independently outside the classroom in the form of projects and research papers. When the classroom is flipped, the low-order thinking tasks take place outside the classroom through reading—or better yet—watching videos and online (or inline) assessments. This frees up time in the classroom for students to engage in the high-order thinking activities with direction and guidance from the teacher. View the infographic below to gain an even better understanding of the flipped classroom and what it looks like. Looking for a great way to keep your mélange of information and resources organized? Try Evernote. Evernote is like an all-purpose filing cabinet that lives in the cloud—accessible from your computer, phone, tablet, and the web. Not everything that lives in Evernote needs to start life as a digital file. You can capture your things you scribbled down by taking a photo with your iPhone or another smartphone. You can record a voice memo and file it. You can also add items via Web clipping through browser plug-ins and email. Once items are in Evernote, they can be organized using notebooks as well as by tagging your notes. You can also share your notes by email, messaging, and Twitter. Evernote can be tailored to fit your needs, and there has broad support—both in terms of community and integration into other apps and services. Check out Evernote at evernote.com. Enjoy! I hope everyone’s New Year has been off to a great start. Below is some information regarding a great (and free) online and mobile study Bible. While I have recommended (and still like) YouVersion as a great Bible for your iPhone or iPad, the Faithlife Study Bible takes is a step further as it contains quite a few study notes. There is also some information regarding how this can be used in school settings available at faithlife.com/about (then click on Faithlife + Schools). The Faithlife Study Bible, worth $89.95, is the world’s largest, most advanced online and mobile study Bible, and you can take it anywhere. Get yours free on your iPad, iPhone, Android device, or online at Bible.Faithlife.com. The Faithlife Study Bible is created by Logos Bible Software—the world’s leading producer of digital content for Bible study. The word “password” has been in the top ten list of most commonly used passwords for some time. Easy to remember? Yes. Secure? Not at all. One technique to aid in memory is to substitute letters for symbols. Instead of password, consider something like p@s$w0rd. The problem is that once we come up with that easy-to-remember-hard-to-guess password, we want to use it everywhere. So that same password that is securing your rather mundane user account on your friend’s blog is also securing your bank, Facebook, and email account. That may seem fine until you read the headline about someone hacking into—insert some big company name here. Then when one password is compromised, the rest go with it. Ideally, you should have a unique, hard-to-guess password for every online account you have—which is a daunting task even for card-carrying members of Mensa. Enter LastPass, an online, multi-platform solution for storing your passwords. This service can be had for free and will keep all of your passwords synced and secure. It also allows you to share and give passwords to other LastPass users. Sharing allows the recipient to use the password without being able to see it, while giving allows for viewing of the password as well. There is also a premium subscription for as little as $1 per month. With the premium version, you can use it with your iPhone or another smartphone. This alone is worth the cost, but you also get multifactor authentication, priority support, and no ads. If you need access to files from multiple devices and locations one of the best solutions is to store those files in the “cloud”—the latest buzzword that you should be saying about 24.3 times a day so that everyone knows that you are “in-the-know”. Google offers a great way to do this using Google Docs. It allows you to create, store, and share a variety of document types that live online—or in the cloud. Sometimes, however, you need to do this with file types that Google won’t handle—like Photoshop files. You also need an Internet connection to access these files. For me, there is also the OCD issue of wanting to have my files on my hardware. Enter DropBox—the best of both worlds. Sign up for a free DropBox account, and you get a place to store your files in the cloud, synchronization with your devices, and the ability to share files with others. NOTE: While DropBox may be a great solution for sharing files, please be aware that what you put in the shared folder takes up space in the DropBox account of each person that you are sharing with. It is also not the best solution for interoffice sharing while on the same network since shared file must first be uploaded, then download via your Internet connection. In those situations, putting the files on a local server may be more efficient. 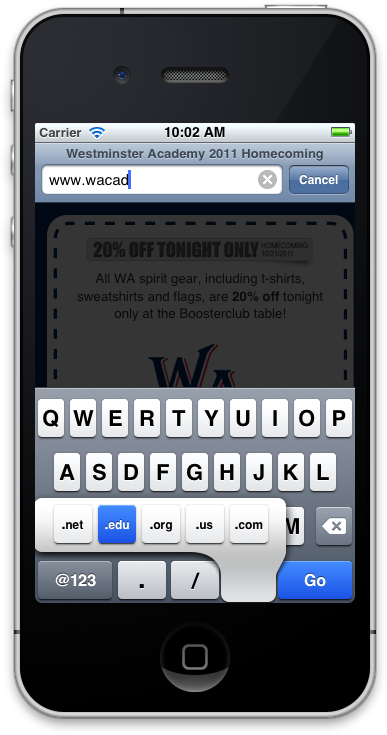 When entering Web and email addresses, the iPhone soft keyboard saves a few taps with its .com key. If you are in Safari on the iPhone, you can even skip this key altogether if the domain name ends in .com. Safari assumes .com if nothing else is entered. For example, to go to http://www.blakejmatthews.com just type in blakejmatthews and tap go. What if the domain name doesn’t end in .com? If you press and hold the .com key .net, .edu, .org, and .us will appear. Then, slide to the one you want and simply let go. One thing Adobe has not always done well is maintaining backward compatibility in their applications. This may not be such a big deal if you work in an isolated environment or only associate with those who meticulously upgrade their software to the latest available versions. However, many real-world projects get passed around between designers, clients, and various vendors—all of whom may not have the same version. Adobe Illustrator was notorious for this, but also offered the graceful solution of simply saving “down” to a lower version. InDesign, however, is not quite so well behaved. There is hope. 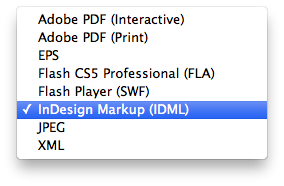 InDesign can export to what is appropriately called InDesign Markup Language or IDML. This IDML can then, in turn, be opened in CS4. If you are doing this to send to someone else, make sure you provide a PDF so they can have something to check against as there is always the chance that something could be off just a bit. If you’re new to OS X or you want to get the ultimate speed upgrade for your Mac, try using keyboards shortcuts. These little gems will boost your productivity and help save your wrists as well. Many functions found in your menu have keyboard shortcut equivalents which appear with somewhat cryptic symbols just to the right of the text in the drop-down menu. One of the best resources I have found in deciphering those symbols and listing shortcuts is Dan Rodney’s List of OS X Keyboard Shortcuts. While you’re there, check out some of his other Tips & Tricks.